PDC RFID dispensing kiosk running KioWare software. Hyland Hills Water World is the largest community owned and operated outdoor waterpark in the United States. Located in Denver, Colorado, Hyland Hills Water World has over 46 water adventures on 64 acres of land. In identifying opportunities to improve the guest experience, Park Manager Bob Owens found that (like most amusement parks), the majority of guests arrive during the park’s first few operating hours. This leads to congested lines at the origination of the guest experience. In order to address this issue, Water World worked with Precision Dynamics Corporation (PDC) to install a PDC Smart® RFID Wristband Kiosk that enables self-service transactions and distribution of Water World lockers rentals. The kiosk was installed with the purpose and expectation of decreasing the long locker rental line without requiring additional attendants to provide service. The kiosk was well received by guests and significantly impacted lines by reducing wait times, decreasing average transaction time, and improving the guest experience. Here are some of the features of RFID bracelets and the Wristband Kiosk, as marketed to guests at the Waterworldcolorado.com website. The kiosk was installed in the locker rental area, allowing users to process their transaction quickly and independently rather than waiting in the line for a guest attendant. To use the kiosk, guests use the touch screen monitor to select a locker size and submit payment. A waterproof RFID enabled Smart® Wristband is then dispensed from the kiosk. Guests use the RFID enabled wristband to unlock the locker when presented to the RFID-reading lock on each locker. This wristband is good for unlimited use throughout the day, and does not require additional payment each use, as required at traditional one-use lockers. EuroTouch provided the kiosk hardware for this particular deployment, the kiosk is an all metal aluminum enclosure, powder coated two tone silver and gray. The kiosk has a sunlight readable monitor and a vandal resistant touch screen for ease of use in all deployment environments. To integrate the many systems and various hardware components, a custom application was built by KioWare developers, running on KioWare Kiosk Full with Server. The application allows the kiosk to accept payment via credit card and communicates payment information to Water World’s system, Mercury Payment Processors. KioWare also interacts with Water World’s high tech Salto Networked Locking Systems to identify the proper unlock code for the selected locker size. KioWare’s custom application then directs the printer to encode the Salto unlock/lock code to the RFID bracelet. That bracelet is then dispensed via the kiosk. In addition to the custom application development involved, KioWare software provides configurable application screens, device monitoring, statistics, reporting and temperature/humidity sensing and alerts, all of which are helpful for deploying multiple devices as well as tracking the activity and health of the kiosk. If the printer is unable to print an RFID bracelet, that information is communicated to the server, where it notifies Water World of the need to add bracelets, or provide maintenance on the kiosk. The pilot kiosk was successful at moving guests into the park quickly. As such, other self-service opportunities are being considered for expansions in the future. Hyland Hills Water World has used PDC’s Smart® RFID technology for other applications such as patron management, access control of season pass holders, and tracking park personnel. Kiosks can be utilized to reload money onto RFID bracelets. These Cashless POS Solutions already exist (they are branded “Splash Cash”) using PDC technology. The additional ability to reload cash via kiosks placed throughout the park will make adding cash to the RFID bracelet quick and easy, providing security and convenience with one transaction. RFID Splash Cash and Self-Service locker rentals both improve speed and convenience, which provides an enhanced guest experience that increases customer satisfaction. Water World benefits with increased sales, improved efficiency, and a smoother guest experience. 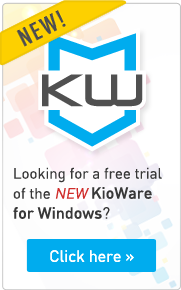 KioWare is award winning kiosk software designed for the Windows OS in 2001, and for Android tablets in 2012. KioWare deploys browser-based applications into a kiosk mode environment easily and inexpensively, securing the operating system, and allowing users to access only the application. Each client has the ability to customize KioWare to his or her needs, with a product line ranging from basic browser-lockdown to server based remote monitoring. photo management systems; and customer loyalty programs. Additional PDC RFID solutions include PDC Smart® Cards, key fobs, lanyards and parking passes. For more information, visit www.pdcsolutions.com. On Dec. 28, 2012, PDC was acquired by Brady Corporation, (NYSE: BRC) a world leader in identification solutions for premises, products, and people. URway Holdings is a group of dynamic companies dedicated to providing unique solutions for our expanding and evolving digital ecoSystem. Our family of dynamic, digital solution companies provide a 360° landscape of the entire Connected Digital World. EuroTouch Kiosks, a brand of the URWay Holdings family, offers the world’s most contemporary and highest quality kiosks and digital signage products available. EuroTouch provides complete self-service kiosk and digital signage solutions for clients in virtually every vertical and horizontal market in our connected, digital, omni-channel world. To learn more about other self-service solutions running KioWare, visit our resources section, specifically Kiosk Security and Privacy. Contact KioWare Sales to learn more about how self-service deployments can improve the guest experience and increase sales. Visit KioWare.com to find software for your kiosk.